Beavers might be honored by the city seal and mosaics at Astor Place, but bunnies know where the fun is. Coney Island derives its named from konijn, the Dutch word for rabbit. It’s fitting that this energetic and fertile creature (rabbits can get pregnant while already pregnant) would define the playground of our city. Today they, and other lagomorphs (they aren’t rodents) might serve as a model for our citywide recycling plan…or maybe not. One thing is certain, however: the Easter Bunny belongs in New York City. Not only was the East Side once significantly German (Germany is the homeland of this myth), but nobody would question the self-identity of an egg-laying bunny dude named Peter around here. 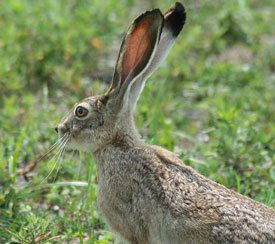 Rabbits and other hares are indigenous to New York City, but the species seems to have evolved in Asia. The earliest fossil evidence for the emerging species, dating back 55 million years, was unearthed in Mongolia. New York City’s section of Long Island’s southern edge is still hopping with rabbits and hares, especially on Jamaica Bay. At the Jamaica Bay Wildlife Refuge you’ll spot eastern cottontails while JFK International Airport boasts a back-tailed jackrabbit population, which escaped from a cargo hold long ago. Other rabbits of the more cuddly bunny kind, and therefore far less able to adapt to the wild, are irresponsibly and inhumanely abandoned in our parks and green spaces. Please consider adopting a rescued rabbit, or supporting or volunteering for the New York City chapter of the House Rabbit Society’s Rabbit Rescue and Rehab group. As herbivores, rabbits are a great eco-pet choice, giving you a far smaller carbon footprint as well as tons of love.